This flavourful two-ingredient sauce is the perfect complement to the crispy chicken legs. Mix coating mix and garlic powder in shaker bag. Add 1 drumstick; shake until evenly coated. Place in foil-lined 17x11-1/2x3/4-inch pan. Repeat with remaining drumsticks. Discard any remaining coating mixture. Bake 30 min. or until chicken is done (170ºF). Meanwhile, mix ketchup and soy sauce until well blended. 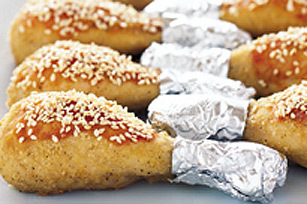 Brush chicken with ketchup mixture; sprinkle with sesame seed. Bake 5 min. Serve with vegetables. Wrap narrow bone end of each drumstick with a strip of foil to make it easy for the kids to pick up and enjoy these ultimate "wings!" Serve with a mixed green salad tossed with your favourite Kraft Calorie-Wise Dressing.